The 2017 ArgoX design comes from 13 years of original kite designs, countless bridle variations, thousands of testing hours with riders of all skill levels and riding styles to design the ultimate all round do everything kite suitable for pro riders, intermediate and beginners. Incorporating into the bridle design a unique 5 point super supportive Heavy Rider Friendy bride and an original high-performance bridle mod addon makes the AX kite the only kite designed for all riding styles and levels. The Argo has been our most popular kite with excellent online reviews saying it is a kite that can do everything for everyone. The stability easy launch, free ride, kite looping and features made the kite popular with many rider styles of different skills. The TRX has been a popular advanced kite with its fast agile turning, excellent drift, light agile feel and top end wind ability. I found that beginners to intermediate could not handle the fast responsiveness of the TRX, and Advanced riders wanted a faster turning Argo kite with more de power on waves. The ArgoX or AX takes the best features from both kites, The AX has more light wind power, more float, higher jumps, even better upwind ability, more de power than the Argo. The AX wave rides, has more de power, faster turning and is as light and fast with the advanced mod added than the TRX. The AX is the most versatile adaptive kite designed thanks to the new bridle hot swap advanced mod. The shape of the kite includes a curved leading edge for the easiest relaunch in light wind, the curve of the leading edge allows the kite to easily roll onto its side for the ideal launching position, the wing tip shape allows for a stable side launch from the water. Easy relaunch is a must for all beginners getting into the sport, wave riders who need to get the kite up quick before it gets hit by a wave. 10 years of testing with all riding styles, skill levels and weights have gone into making this ultimate all round do everything, massive wind range rock solid bridle design. With countless bridle experiments using 0 to 8 pulleys, long bridles, short bridles, Using 4 to 10 Leading edge attachment points and an endless variation in each bridle line length we have refined the AX bridle into something truly amazing. The 10 points where the bridle attaches to the leading edge gives unmatched support to the kite in strong gusty conditions as well as for heavy riders. The bridle design allows for maximum de power and power in the kite, fast and slower turning speed while supporting the kite shape in light or strong winds, gusty conditions or with heavy riders pushing the ability to the limits. As a designer I could see from other kites with less attachment points deform in overpowering, gusty conditions or with heavy riders pulling powered moves. Working with light and heavy riders we have designed a bridle that is super strong and supportive. The AX bridle is a one of a kind bridle with some never seen before original design features. After designing race kites, high performance super agile fast kites, learner friendly beginner kites, wave kites and free ride kites I found that one kite style does not fit all skill levels, unless something new was done. Beginners to intermediate want a predictable medium turning fun kite that is super stable, very easy to relaunch, wave rides and jumps high with plenty of float for soft landings and will allow progression into kite loops. Smooth power to de power and light to medium bar pressure. Pro riders. After 10 years of riding, I like a very agile, very responsive fast turning kite, with quick full de power, light bar pressure and instant turning so I can fully de power the kite and ride waves without having any pull against the kite, instant pivot turn the kite around with full power or no power, do quick kite loops or double kite loops and maximum low wind range for the light wind days. From 10 years of original kite and bridle designs, i learned that the bridle can make up 80% of the kites performance, with the one kite shape/design, and only the bridle, and adjusting bridle lengths, angles, and positioning, you can make the kite a fast agile high-performance kite, or an all round beginner to intermediate friendly kite, more wave orientated or more free ride freestyle orientated kite, or a mix of all. From countless prototypes I found that just moving an attachment point a few cm up or down the leading edge does not make a lot of difference in kite performance. It makes a little difference, but not a lot. What makes a massive difference in the feel of a kite, is changing entire parts of the bridle. One kite for super high performance or all round do every thing beginner intermediate or pro. The AX original design kite comes with a short pulley-less bridle suitable for wave riding, free ride, freestyle and all riding skill levels. A short bridle reduces line tangles and catching bridles on the kite, and no pulleys no wear points on the bridle lines, less repairs, less chance of bridles breaking and longer lasting lines. The out of the bag setup will suite 95% of riders who are just getting into the sport for the first time or have been kiting for many years. Once a rider has reached the 95% mark and want to step up to a super high performance, fast turning, agile kite with quick full power to full de power, there are 4 lines in the bag, which will change the bridle into a super high-performance agile kite. Back in 2007, 8 strut kites where very common, they were heavy and slow, the extra weight made the kites unstable in light winds, Today there are 0, 1, 2, 3, 4 strut kites. After using strut less, 3 strut, 2 strut and 4 strut kites I found I prefer 3 strut kites. A 3 strut kite is a good combination for keeping the canopy and kite solid during relaunch and in strong gusty winds while keeping the kite light weight. 5 struts start to get to heavy, 0 to 2 struts don't give enough support to the kite shape and canopy. Our Kites are designed with a reflex profile. Reflex profiles are naturally resistant to luffing making our kites one of the most stable on the market, which is ideal for learning, lessons, wave riding and beginners to pro riders. The profile is super efficient after 10 years of fine tuning and is different for every size of kite, the larger kites are designed to get more power, the smaller kites are designed to handle strong winds with excellent light wind ability. The profile of the AX is variable, more profile in the center of the kite to generate more lift, less profile around the wing tips for faster turning and less drag with a smooth rounding off from no profile to lots of profile in the center. ( profile is the curve of the wing, and is what generates lift, a good profile will give excellent upwind ability. New for 2017 is a single large max air flow inflation valve. The valve is one way to stop loss of air when removing the pump and deflates the kite quickly when removed. 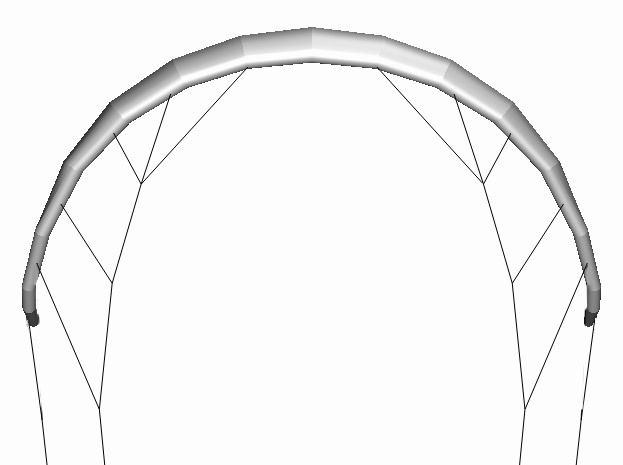 Struts and Leading edge are connected for a fast and easy inflation of the kite from a single point. We are avoiding all black kites for the simple reason of being easy to see if your out in the water or may need to be rescued, black and white kites have poor visibility at night or in choppy water or in the snow. They look like a rock, or white caps, or the dark ocean at dusk or night. White kites also get dirty quickly and look old fast. All the AX colors are designed to bee seen from a good distance if your in the snow or sea during the day or night. Bright colors make for safer kites. The medium aspect design gives incredible light wind ability with more canopy in the center of the kite where lift is most needed to get more wind/power on a smaller kite, the power is smooth on to off with a great springy feel. The 10 point bridle gives much more Kite and Leading edge support in strong winds than a 6 point bridle ( 5 Bridle attachments on each side of the kite ). The AX bridle is designed to de power in strong winds similar to a 5th line kite but without the extra line, the amount of de power you get from the kite is massive. This makes wave riding excellent as you can turn off the kite power and enjoy the wave without having to fight/pull against the kite. The max de power is also excellent for learning as you can de power the kite quickly if needed. The kite holds its shape in strong overpowering winds while being easy to control and turn. Kite and bridle design never stops, a few cm difference in 20 meters of bridle line can make a huge difference in how the kite feels, a bridle is 80% of how a kite flies and performs. At the end of the season, if a updated bridle is designed AX riders will be able to upgrade there kites with a new bridle. For around $80 you can get a crispy new bridle with better performance for your 1 year old kite. This is something no other brand does for there riders. Kites are designed and tweaked in Australia, with some of the worlds best waves and beaches. We have an International team of riders from many different skills and styles who test and give feedback on the kites. As a designer I know what I like in a kite, and also listen to what riders of all skills and styles are asking for. the AX is designed for riders of all skill levels and riding styles, with exceptional wave riding and freestyle ability, and a advanced mod that turns the kite into a very fast agile high performance machine. I love riding in the waves strapped and strapless, I also love riding flat water with big airs and kite loops. The AX is excellent in the waves with amazing drift, responsive pivotal turning, stability, a direct feel with no pulley attachment to the kite and is a lot of fun in the waves. The AX also jumps huge with lots of height and float for softer landings and is great for kite loops. The solidness feel and direct connect of the AX makes for a great freestyle and free ride kite, high jumps and fast kite loops. with floaty jumps and soft landings. The combination of responsive turning and performance of the kite makes for a very fun all round do everything kite. The wing tips of the AX have been squared off, this gives a better feel and more responsive turning, less drag on the wing tip during turns and a better upwind performance. Direct connect turning and feel without pulleys. Pulleys on a kite can make a kite feel spongy and defiantly is a weak point with pulleys rubbing against line creating wear leading to snapped bridle lines or regular replacement of bridle lines. Pulleys also cause a kite to hunt the water, this is where the kite feels like it wants to dive towards the water, a little pressure on the bar turning the kite up is needed to prevent this. No pulleys is a more direct connect feet to the kite, there is less water hunting with the kite not wanting to turn to wards the water and no parts of the bridle line under constant wear from sandy pulleys rubbing against bridle line. A pulley-less bridle is 100 times harder to get right than a pulley bridle, once optimized a pulley-less bridle can turn faster, have more power, more de power and a better feel than a pulley bridle. The combination of a medium aspect kite with a reflex profile and a 10 point pulley-less bridle design makes for an incredibly stable kite in light winds, gusty winds and varied conditions. The leading edge tips of the kite are designed with zippers, not Velcro. An issue with Velcro is the folds in the wing tip bladder to get around the Velcro can cause LE bladders to pop. With a zipper in the wing tips, there is no folding of the bladder, and the LE bladder is much easier to access with less chance of twists and bubbles forming. Also zips are much stronger than Velcro wing tips. Wind range varies depending on riders weight and board size. A 50kg rider will get going in light winds where as a 120kg rider will not. A rider on a surf board will do a lot better than a rider on a 128 twin tip in light winds. The below is a guide from riders of different weights on different boards. IMPORTANT beginners should not go out in strong winds they are not use to. An advanced rider can handle 30 knots, a beginner learning should learn in light winds. The below is a wind range for skilled riders who know how to ride and have excellent experience in strong winds. Default Bridle for all skill levels on the left - The Pro Bridle which is very fast on the right, light, agile, responsive, quick power to depower, for advanced riders only. The change is made by replacing 2 lines in the bridle. The pro bridle is not suitable for most riders who do not have the reflexes and experience to handle a fast kite with fast full depower. Made with the best materials available, Teijin canopy from Japan, Cousin lines from France, Ronstan Parts from Australia and tested and refined globally.